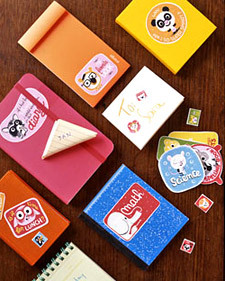 From notebooks to labels to stamps, there are so many ways for you to help your kids make their mark on the world. Or at least their school supplies. Today's back-to-school post is about making your kids' supplies unique to them. Photojojo has an amazing video tutorial to help you make these adorable photo journals! Take any photo and make it into the cover of a handmade book, perfect for taking notes, making lists, or just doodling. No one will mistake the owner of this notebook! What a rock star! Greetingarts comes through for us again with a tutorial for these awesome covered sticky note pads! These can be made to fit any personality with the appropriate patterned paper. Makes a great teacher gift, too! LOVE the papers she chose for the classmates of her daughter's kindergarten class. Can I go back to kindergarten for a day? I want one! Here are a few we made from her instructions. Being a small fish in a big pond means it can be hard to keep track all your stuff. 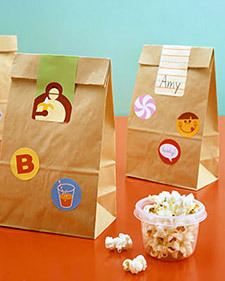 Help your little one out by labeling his or her lunch sack, notebooks, and textbooks with these printable labels from Martha Stewart. You can download two different sheets--notebook labels and lunch labels--and then print them on self-adhesive sticker sheets, available at office-supply stores. So fun! Teachers shouldn't have any trouble identifying the owner of any item with their face stamped on it! Craftpudding makes custom stamps from a picture of your child. They are incredibly darling. You can even have their name put under their likeness. Check out her blog and her etsy.com store. She is out of town so I couldn't ask permission to post photos of her work--you'll just have to take a look for yourself! I still can't believe the time and talent it must take her to create these little gems. If you're really ambitious, try making your own stamps with plastic erasers with this tutorial. Don't forget--if you carve a name for a funky label stamp, it should be carved backwards so it reads the right way when stamped. Okay, so now that you've labeled everything your child owns, leave us a comment with your blog link so we can enter you in our giveaway! You'll get something from every back-to-school post this week! Thanks for the feature posts, guys. I wrote up a little blurb today and linked over to you, you've got a great thing going here. Keep it up! Love the stickers from martha stewart. Also love the notebooks with the custom paper. This whole weeks worth of blogs have been so cute! I love your blog. So many great ideas!!! I love those notepads. I'll have to make some of those. And which momma is the proud owner of the rockstar! He's too cute. There are terrific ideas! I better get to work - My kids start school tomorrow! One can never have too many notebooks!